Do you love packaging tape? The sound as its stretched over your package? The way it takes all oils and fuzz from you and applies it to your package to share with your swap partner?! For this swap I'm challenging you to make a postcard out of clear packaging tape with a ST Patrick's Day/Spring Theme. For this swap, Postcards must be rectangular. Minimum 3.5" high, 5" long, .007 thick or Maximum 4.25" high, 6" long, .016" thick. http://www.kimcollisterstudio.com/2017/10/tutorial-for-packing-tape-cards.html?m=1Get creative! Use things that make you happy! Share the packaging tape love! Make a rectangular postcard from clear packaging tape within the guidelines above. Add fun flat goodies.. washing, sequins, stickers, magazine clippings, fun papers ect. DO NOT coat a regular postcard in packaging tape! That is not the point! 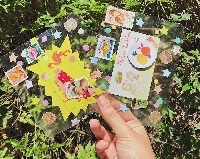 As long as you receive a postcard made of packaging tape, that has flat goodies inside. Rate a 5. If it's pretty amazing to you give a heart. I check profiles. No recent 1s or 3s. Newbies are welcome with a well filled out profile. I was once a newbie so I'm giving you an opportunity. I will angel for anyone who gets flaked on. Contact me first. This is for US only. Feel free to host an international swap if you'd like. So happy to see another one! I enjoyed the first Valentines one! Yay! I have large sheets of clear tape material that i can cut to 4X6’’. Can i use those in place of strips of packing tape? I'm so excited for this! When will partners be assigned?